This sad and heart wrenching reality of these children would urge you to make this world a better place. The realm of art can provide us with a parallel universe, it can recreate the harsh and bitter reality we face everyday. 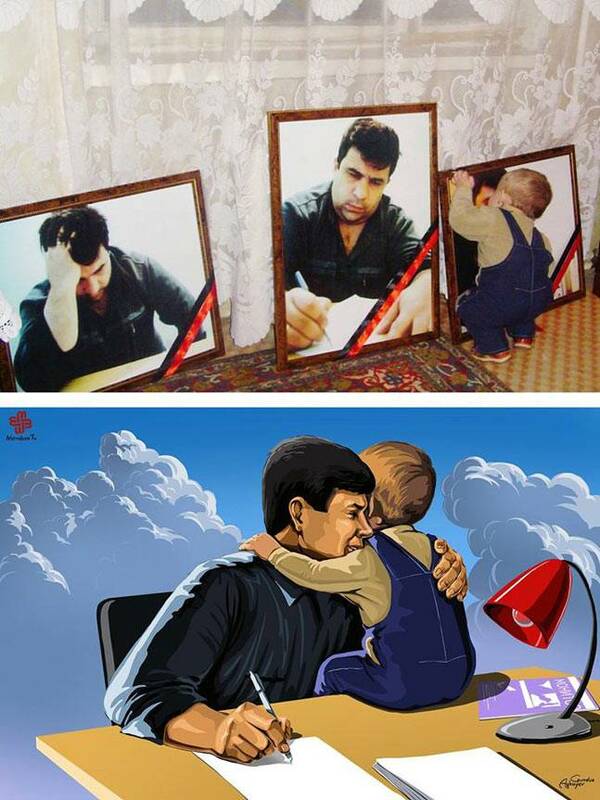 This is what painter Gunduz Aghayev did with his art. 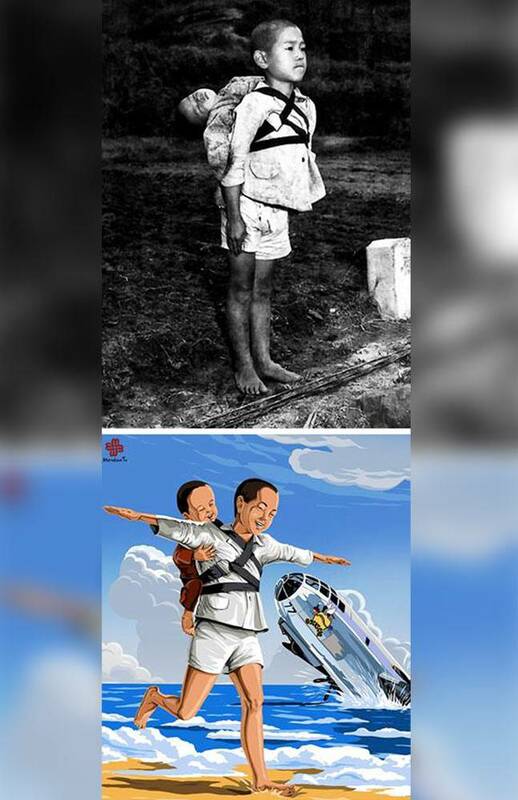 In a series of illustrations called “Imagine”, the artist has altered some iconic photographs of children who have been the victims of tragedy. The alteration is such that it makes the world a better and a happier place for children to be in, through his work the painter condemns the violence inflicted on children. According to Human Rights Watch figures of 2006, 14% girls in Yemen are married by the time they turn 15 and more than 50% before they reach adulthood. 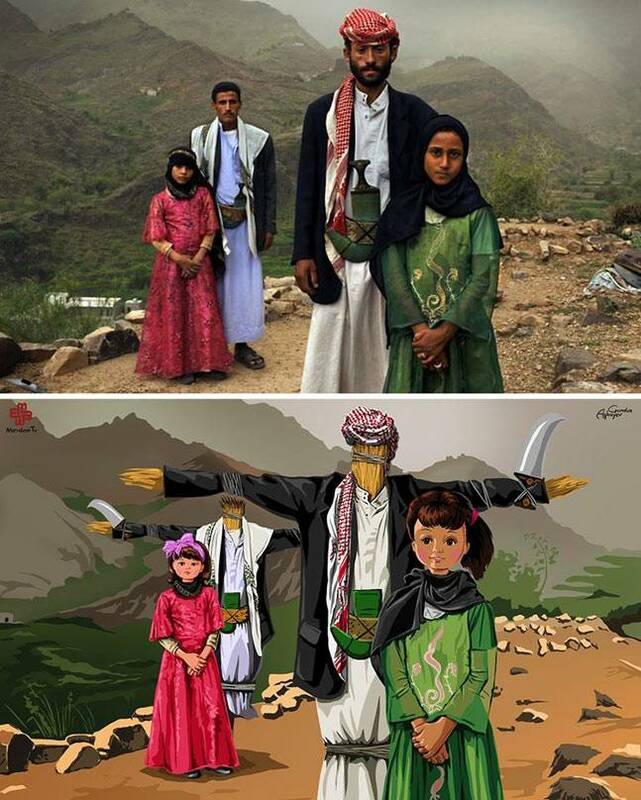 This photo of child brides Tehani (in pink) and Ghada is the representation of the plight of girl child in Yemen. South African photojournalist Kevin Carter received the Pulitzer prize for a photograph which depicted the 1993 famine in Sudan. He is said to have committed suicide a few months after he was honoured with the award. The actual picture depicts a vulture stalking a starving girl. 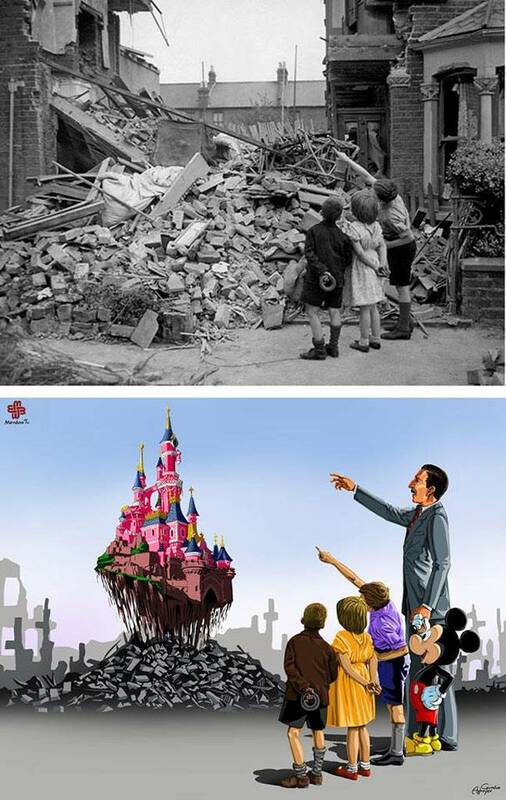 In the original picture, a boy points out his bedroom to his friends in London which was bombed by the Germans in 1940. The illustrations presents the sweet fairy tale like childhood the children should have witnessed. Captured by AP photographer Nick Ut, this photograph too won a Pulitzer prize. 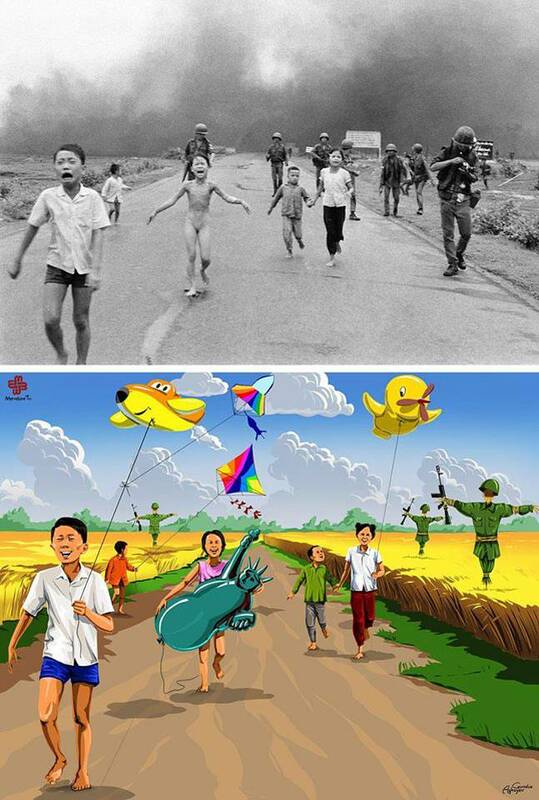 It was taken during the Vietnam war in 1972 and shows the Vietnamese-Canadian nine-year old running naked after being burned by a South Vietnamese napalm attack. The girl is seen holding the statue of liberty as in Vietnam the war is known as Resistance War Against America. 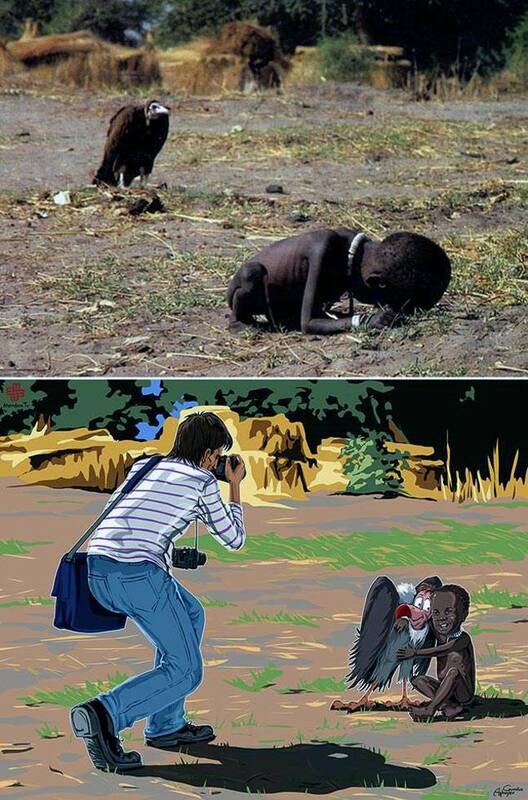 The illustration depicts the reality which the innocent son of the journalist deserved. The picture of three-year-old Syrian boy made global headlines after he was washed up dead on a beach in Turkey. A sibling is the best gift of an individual’s childhood. But this Japanese boy had to cremate his dead younger brother instead of having fun in his childhood.Isn’t it mentally scarring? Shouldn’t the world be a better place, if not for anything else, for such children?